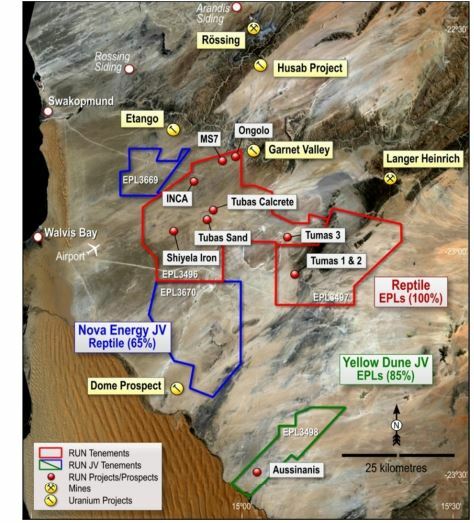 Deep Yellow Limited recently announced encouraging results from the 10,000 metre drilling programme currently underway on EPL3496, held by its wholly-owned subsidiary Reptile Uranium Namibia. Uranium explorer Deep Yellow is listed on the Namibian Stock Exchange. In a Stock Exchange News Service announcement this week, Deep Yellow said that the ongoing drilling of the Tumas 3 target zone has delineated additional uranium mineralisation, significantly extending the discovery since it was initially reported in April. “Of the 144 vertical holes drilled for 3611m to 15 May 2017, 128 of these holes returned positive results – a very significant 88.9% success rate. This drilling has extended the palaeochannel associated mineralisation by 58% to 1.9 km from the 1.2 km previously reported,” according to the SENS statement. “The Tumas 3 mineralisation still remains open, strongly justifying continued drilling and sourcing a second drilling rig to accelerate the programme. Drilling is conducted on a 100m x 100m spacing [grid] and on programme completion, will be of sufficient resolution to estimate a maiden inferred resource in the September quarter,” Deep Yellow added. According to the company, this emerging discovery occurs as a distinct mineralised zone separate from the uranium resources they identified within these palaeochannels in its Tumas 1 & 2 and Tubas Red Sands/Calcrete deposits. “The palaeochannels occurring away from these deposits have only been sparsely drilled along widely spaced regional lines, leaving opportunity for both continuing the extension of Tumas 3 and for further discoveries within what can now be seen as an inadequately tested, highly prospective palaeochannel of 100 km in length,” they said. Meanwhile, the company concluded that the continuing positive drilling results from Tumas 3 again reinforce the strongly held belief of the new management and technical team that the palaeochannels occurring within the RUN held tenements present a valid and significant regional exploration target. “These new positive results, together with approximately 100 km of prospective palaeo-drainage identified as still to be tested, provide management with increasing confidence that the existing uranium resource base within the Reptile project area can be increased,” they said.